Advertorial by Huawei: The opinions expressed in this story may not reflect the positions of PhoneArena! Huawei is one of the fastest-growing phone makers in the world, with a range of premium devices to suit even the most demanding of users. So if you are in the market for a new premium handset then Huawei’s latest offering, the Mate 10 Pro more than merits a look! While stunning looks, a powerful chipset and a great camera make for an impressive device to tell your friends about, when it comes to showing it to them, you really need battery performance that won’t let you down. Thankfully with a massive 4,000 mAh battery, the Mate 10 Pro has more than enough power onboard to impress your friends. And when the time does come to top up the battery, Huawei’s own SuperCharge technology (which is the first fast charging technology to be certified by TÜV Rheinland, a global leader in independent product inspection services) can take your Mate 10 Pro from 0-58% charge in just 30 minutes. All of which means that in just half an hour you will have more than enough in the tank to last you through the day. For long days out with the family or a busy day of back-to-back meetings, EMUI 8.0 on the Mate 10 Pro has you covered. Offering two power saving modes that enable you to get the most out of every drop of power, EMUI 8.0 helps you get through a full day of heavy usage. And to ensure you know which apps are hogging the battery the most, EMUI will also provide notifications about which ones could be closed, further aiding you in getting through the day on a single charge. Furthermore, the Mate 10 Pro is also able to provide power management with a personalized approach thanks to the NPU inside the Kirin 970. Over time the Kirin chipset learns what sort of user you are and optimizes settings and power allocation. For instance, if you are a gamer, the Mate 10 Pro will adjust settings such as the speaker volume level and screen brightness to ensure a great user experience while still maximizing battery life. By utilizing the power of its huge 4,000 mAh battery and AI intelligence, the Mate 10 Pro is more than capable of keeping you going! With the Kirin 970 on board, the Huawei Mate 10 Pro has a camera that actually understands what it is looking to capture better photos. With its AI capabilities, the camera can recognize what type of scene you are taking a picture of and adjusts settings accordingly to achieve the best result. These adjustments have been carefully developed, and are accurate enough to tell the difference between your pet dog and cat. This works in tandem with a new 4-in-1 auto-focusing system that uses laser focus, phase detection, depth and contrast focus for zero-lag photo capture. The camera also features one of the widest apertures ever seen on a smartphone. At f/1.6, the camera can capture more light and create an impressive depth of field 'bokeh' effect in pictures. The main rear camera works in tandem with a secondary monochrome sensor to deliver stunning images that are great for sharing with friends via social media. What’s more, you can even use the dedicated monochrome camera to take super stylish black and white images that pack in high levels of detail and sharpness, providing a unique look to your pictures. The name of the chip is the Kirin 970 and it is made by HilSilicon itself, a company with a long established reputation in networking and chip-making. The Kirin 970 is built on the latest and most advanced silicon manufacturing process that is able to pack 5.5 billion transistors into an area just 1cm2. In addition to that, the chip is the first to come with a dedicated Neural Network Processing Unit, or NPU, making it the first AI mobile computing platform, capable of handling AI tasks in a fraction of the time that other mobile chipsets take. As well as packing eight cores into its CPU, the Kirin 970 also offers something special for gamers. It’s the first chipset to include the new Mali-G72 graphics processor, which means it packs 12 powerful cores in its GPU to handle even the most demanding of mobile gaming scenarios. 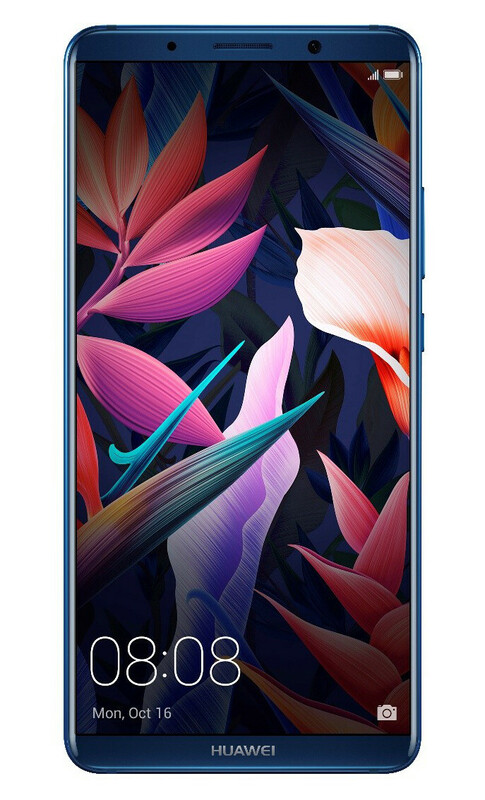 At the front of the Huawei Mate 10 Pro is an incredibly immersive 6-inch OLED screen with a Full HD+ resolution of 1080 x 2160 pixels. This offers great image quality, without draining the battery. It's a gorgeous, bright screen with lively colors and impressive contrast. What’s more, the Mate 10 Pro also features a beautiful, stylish glass back, a sturdy metal frame and a distinct camera accent line that distinguishes it from other devices, making it instantly recognizable. The Huawei Mate 10 Pro has four eye-catching colors to pick from: Midnight Blue, Mocha Brown, Titanium Gray and Pink Gold. But it's not just about the Mate 10 Pro’s stunning looks as it also features an IP67 water protection rating. Whether you a relaxing by the pool or needing to book a cab in the rain, you can do it without needing to worry about the Mate 10 Pro getting wet! The Huawei Mate 10 Pro offers all the specifications and features you should expect in a flagship device. Gorgeous screen, unique and user friendly AI features, unparalleled battery performance and a powerful chipset all wrapped up in a beautiful glass and metal body - the Mate 10 Pro is a standout device. Currently available in Europe and other markets at a price of around €800 (or £699 in the UK), the Mate 10 Pro is an incredible deal for a premium handset. Looking for a new device to kick start 2018 with? Then look no further than the Huawei Mate 10 Pro. Phonearena sponsoring a phone that will never hit the US. Smart. Valid point. I'm glad you like it! The battery life sounds incredible. I wish we would get this in the US but it sounds extremely unlikely at this point. I just don't get it why companies like Huawei and HTC didn't add wireless charging to their all glass phones! The 10 Pro would've been mine if they didn't skip on wireless charging, and most importantly getting rid of the micro sd slot. I have grown into liking the 18:9 aspect ratio, that's why the Mate 10 doesn't interest me. My sister in law has one, gorgeous phone, and quite capable, but it has it's shortcomings. But for the price, nothing comes close imo, it's sold for 550 dollars here in my country, and for that much, you can't get a better device right now. Have you thought about the V30? It has all of those options but it's definitely pricier. Or perhaps a OnePlus 5T? Or are those devices not available in your country? I got myself a Note 8. I had an Essential Phone prior to it, used for 10 days, but it wasn't for me. The V30 is 100 dollars cheaper than the Note 8, but it's slightly inferior in bunch of stuff that I prioritize, that's why I ended up going back to Samsung. How are you liking the fingerprint scanner on the back? Even with my abnormally large hands, it still isn't ideal for my usage. I'm really hoping the Note 9 will have the fingerprint scanner embedded in the display (or another great available device) so hopefully my Note 5 will continue to run smoothly up to my new smartphone purchase. I had the S8 Plus before the Essential Phone, so I'm pretty used to the fingerprint scanner placement. I use the IRIS scanner majority of the time, but I have never had any issues with the fps. Mate 10 could also be a good proposition if priced right. It's shorter and it has a front-faced fingerprint reader. Where is the headphone jack???? Huawei get your s**t togheter. Sammy can waterproof with headphone jack, how come you cant?